Disease of the endocrine system include diabetes, and endocrine imbalances of the thyroid, parathyroid, pituitary, pancreas, and adrenal glands. In order to treat diseases in the endocrine system, it is often required to use drugs to restore balance in this delicate and powerful system. 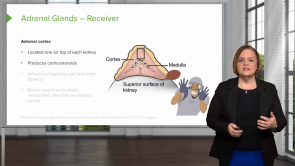 As a nurse, you need full understandings of how the endocrine system works and what interactions you have to look for. Therefore, reviewing your theoretical knowledge of endocrine disorders is the first approach to learning the appropriate medications, such as corticosteroids and insulin.